The average full-time working woman earns 82% of what the average full-time working man earns, according to BLS data. The good news is that the gender pay gap is shrinking. The bad news is that the narrowing of the gap comes too late for women who started and ended their careers when the pay gap was worse. That wide difference in earnings has hurt women’s ability to meet their financial goals. Survey of Consumer Finance data shows that using financial advisors for investment advice has only become popular recently. This means many of today’s retired women faced both lower earnings and lack of access to the best advice. Below we look at data for senior women and men to find the places with the largest gender retirement gap. Check out our data and methodology section below to see where we got our data and how we put it together. Texas, Virginia and California – Seven of the top 10 cities with the largest retirement gap are located in three states – Texas, Virginia and California. Three cities are in Texas, while the other two states are home to two each. In some cities, women are better off than men – In total there are 24 cities where the average woman age 65 or older who lives alone has a higher income than her male counterpart. The three cities where the women in this position have the highest incomes compared to men are Baton Rouge, Louisiana; Glendale, Arizona and Washington, D.C. In each of those cities, the average senior woman who lives alone has an income that’s at least 125% of the average senior man’s income. 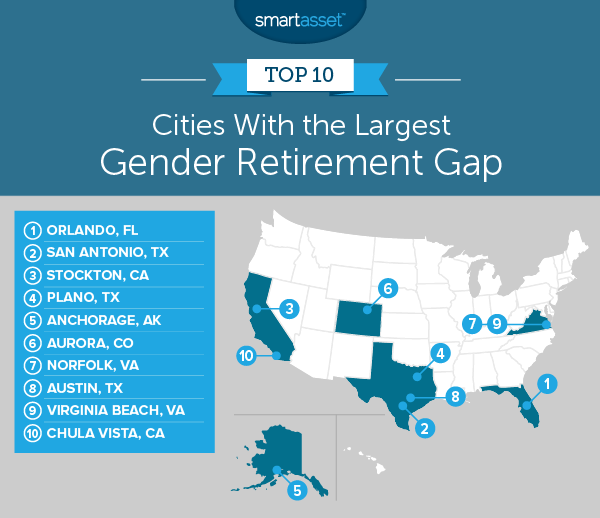 Orlando takes the top spot for the city with the largest gender retirement gap. Men and women here have fairly high incomes by the standards of this study. The average senior woman has an annual income of $23,400. In comparison, the average male’s income is over $40,400. That leaves Orlando with a gender retirement gap of 58%. San Antonio takes second. This city is one of the most popular places where retirees are moving, however men are living a more comfortable retirement here. The median women over the age of 64 and living alone in San Antonio has an average income of $19,800 per year. The average male in the same circumstances has $33,300 in income per year. That means the average senior woman’s income is only 59% of what the average senior man’s income is. The median home in San Antonio costs $926 per month, which would leave the average senior woman living alone severely housing cost-burdened. Women over the age of 64 and living alone in Stockton earn less per year than they do in the two cities ranked above. Overall the average women over the age of 64 has an annual income worth 60% of what her average male does. Another concerning trend for retirees is the cost of housing. The median home in Stockton costs over $1,100 per month, which is unaffordable for both men and women over the age of 64 who live alone. The median income for woman over the age of 64 is 62% of the average man’s income. That means Plano has the fourth-worst gender retirement gap in our study. n the future we may see Plano climb this list. The latest data shows that the average full-time working woman in Plano has an income that’s just under 73% of what the average full-time working man’s income is. That’s a below-average rate compared to the national average. With women in Plano continuing to be underpaid compared to men, it will be hard for the gender retirement gap to narrow. Living in Alaska is expensive, especially in Anchorage. According to Census Bureau data, the median home in Anchorage costs over $1,500 per month. That puts pressure on any retired person’s budget, but women have it especially tough. The average woman over the age of 64 takes home only $25,800 per year compared to $48,500 for men. That leaves Anchorage with a gender retirement gap of 62%. The average Aurora woman over the age of 64 takes home only 62.2% of what her male counterpart does. That places Aurora in sixth. However the situation is quite different for the younger generation. The average full-time working woman in Aurora earns 101% of the what the average man does. In other words, Aurora’s gender pay gap favors women. Norfolk, Virginia ranks seventh. 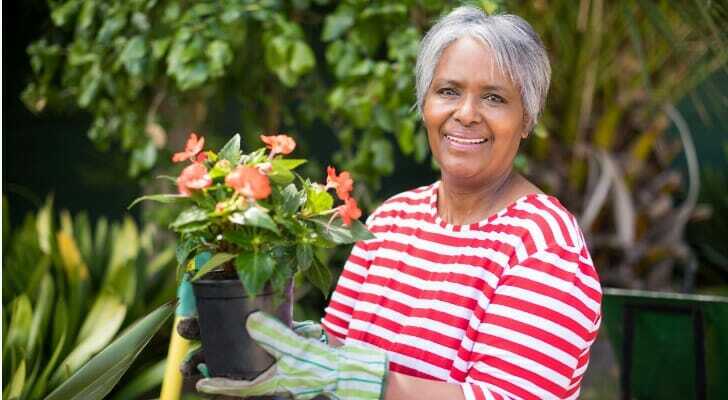 Overall women over the age of 64 who live alone take home $19,900 per year. Men in the same position earn upward of $31,600. That leaves Norfolk with a gender retirement gap of just under 63%. One piece of good news is that the average full-time working woman in Norfolk today earns 81% of what full-time working man do. Hopefully with the lower gender pay gap, the gender retirement gap in the area will narrow in the future. The third Texas city in our top 10 is Austin. Compared to other cities, the 65 or older crowd in Austin do quite well. The average female senior who lives alone has an income of just under $27,000 per year. However the reason this city has a high gender retirement gap is the median income for men. The average male senior who lives alone takes home just over $41,000. That leaves Austin with a gender retirement gap of 65%. This coastal city ranks ninth. Seniors in Virginia Beach surpass all others in our top 10 when it comes to income. Male seniors who live alone have an annual income above $50,700. Female seniors who live alone have an average annual income of $33,300. That leaves Virginia Beach with a gender retirement gap of 66%. The final city to rank in the top 10 is Chula Vista. Overall female seniors who live alone take home over $20,600 per year, while men over 64 who live alone take home $31,400. A big concern for seniors here is the cost of housing. Census Bureau data estimates that the median home in Chula Vista costs just under $1,700 per month. That is roughly $20,300 in annual housing costs, almost identical to what the average senior woman living alone has in annual income. Median annual income for women age 65 or over who live alone. Data comes from the Census Bureau’s 2016 1-year American Community Survey. Median annual income for men age 65 or over who live alone. Data comes from the Census Bureau’s 2016 1-year American Community Survey. To create our final rankings, we divided the annual income for women by the annual income for men. This left us with women’s income as a percent of men’s income. 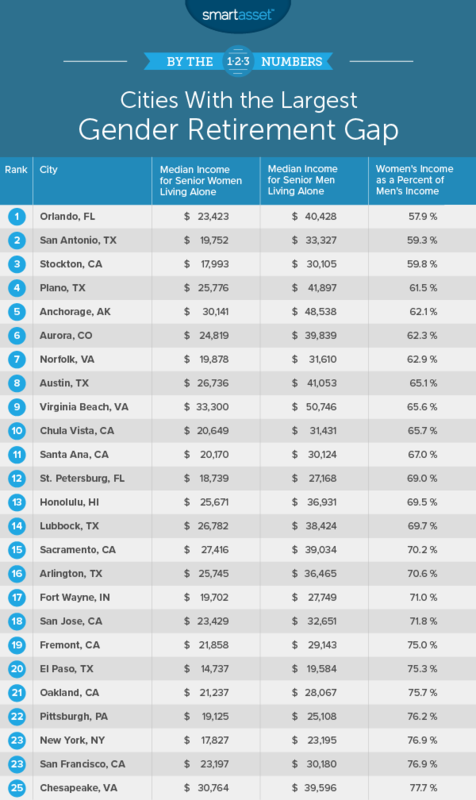 We ranked the cities from lowest (where women earn the least compared to men) to highest (where women earn the most compared to men). Save early – Whether or not you have a secure retirement depends on how much you managed to save during your working years. However, not all saved dollars are equal. If you save $100 at 35 and invest until 65 with 6% returns, it will be worth $574. That means saving $100 at 35 is equivalent to saving $574 at 65. While it may be more difficult to save when you are younger and possibly have lower earnings, saving in your younger years will be a worthy sacrifice comes retirement time. Talk to an expert – Even if you are saving early, there is no guarantee your investments will grow the way you want them to. One way of getting the best investment advice is to talk to a financial advisor. A financial advisor can make sure you are taking all the necessary steps for a secure retirement. If you’re unsure where to find a financial advisor, SmartAsset’s financial advisor matching tool can match you with a local advisor who fits your specific needs.